From Instagram likes to Bumble matches, society today has become accustomed to temporary highs and quick fixes. With technology powered endorsements at our fingertips, it’s easy to forget that, if you really want someone’s affection, you have to actually earn it. The same principle can be applied to customer relationships. To really thrive in ecommerce today, you need to show customers you genuinely care. We’re under no illusion that going the extra mile is a pioneering concept - six years ago American Express revealed that seven in ten Americans were willing to spend an average of 13 per cent more with companies they believed offered excellent customer service. We are, however, worried it is a concept in danger of becoming extinct and replaced by cheap thrills. Here are six examples of brands keeping this age-old practice alive through awesome customer service - starting with small, simple gestures and working our way up to bigger, more innovative initiatives. When marketing manager Hannah ordered a leopard print leotard from Nobody’s Child, she didn’t expect to also receive a new addition to her jewellery-box. The pretty green bracelet pictured below was included in her delivery, alongside a heartfelt welcome/thank you note from the brand. As an alternative to giving your customers a gift, you can present them with the gift of giving. This is something startup Unlease quickly clocked onto with its social experiment PineappleToday - carried out alongside the company's launch. Of Ometria's 30 employees, two received a pineapple in the first week the experiment was launched. 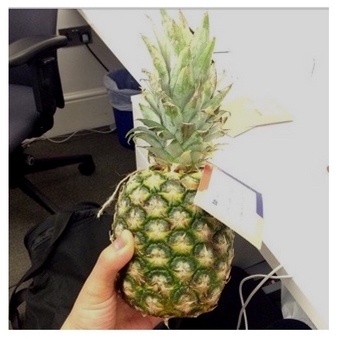 It had the whole office talking, eager to find out who exactly Unlease is and why they were sending us pineapples. It also gave us all a nice 11am snack. Earlier this year, we interviewed former head of loyalty at tech and publishing business Lost My Name, Ira Wichmann, about personalising the customer experience. Lost My Name uses technology to create physical children’s books that are bespoke to each child. When not selling books, the company uses the data collected during the order process (for example, name and address) to treat customers offline. Last Christmas Ira and her team delivered Christmas cards to 5,000 customers who had purchased books for their loved ones: a simple act of kindness, but no doubt made each recipient feel truly unique. Almost one year on, and Lost My Name continue to treat their customers. The company recently sent one customer’s son a postcard (pictured below), written from the perspective of one of book characters. Potentially time-consuming, but - with over 100 likes on Instagram - worth it. Postcards are just one form of written correspondence you can use to treat your customers. If you sell to a more mature audience, it could be worth going for something a bit more longform. A case in point comes from chief customer officer at Ometria, James. 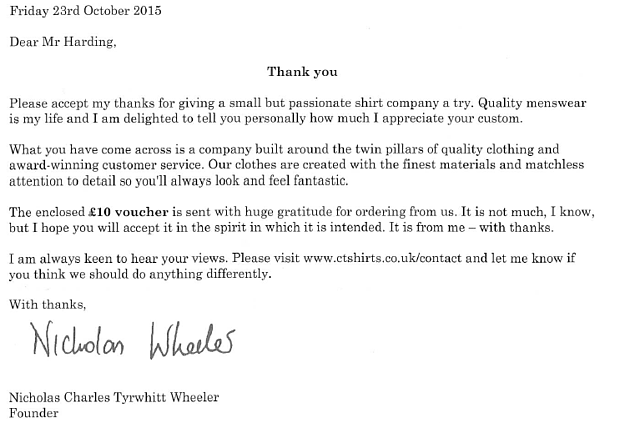 A few years ago, James received a personalised letter from CEO and founder at Charles Tyrwhitt, Nick Wheeler, after he bought his first shirt from the brand. The letter, which came with a coupon in tow, explained the history of the brand and why James’ purchase was so important to him. "He talked quite personally about how he started the business, including some of the mistakes he made along the way," James said. "It was very funny, and finished by saying he’d only managed to build the business because he has people like me making purchases". James isn't the one to have received a personalised letter from the menswear label. Blogger JJ Harding has also spoken about correspondence with the brand, which you can read here. When we say it's important to "go the extra mile" for your customers, we're not just referring to tangible objects you can send in the post. When business development executive at Ometria, David Wardle, spotted a shirt he liked in T.M. Lewin, the only thing preventing him from making a purchase was the fact that he wanted to wear it immediately, but was concerned it would look better ironed. Luckily for David, an assistant at T.M. Lewin (Oxford Street) offered to steam iron the shirt for him there and then. This didn't just win the retailer a sale, but also a new loyal customer. There are a handful of brands that have become downright legendary for their astonishing customer service, Zappos being one of them. From teaming up with Massachusetts Department of Transportation to pay for tolls during rush-hour to a ten-hour customer service call, the Las Vegas based online retailer is full of endless awesome customer support stories. Our personal favourite Zappos story concerns a best man and a pair of shoes - or lack of them. In 2011, best-man Jay ordered shoes chosen by the groom on Zappos.com and paid for 3-Day Select shipping from UPS to ensure he would get them in time for the big day. Unfortunately, however, drama ensued: UPS sent the shoes to the wrong address, leaving Jay shoe-less with little time to purchase more. He made a last-minute call to Zappos to see if they could help the situation, and by jove they did. "Zappos has earned a customer for life — In addition to all of this, I originally ordered from them because they had the cheapest deal on the shoes I needed." Department store Nordstrom is another icon in the customer service world, with one of its most famous tales dating back to 1975. Legend has it a disgruntled man approached the Alaskan Nordstrom outpost and - out of the blue - asked to return a set of worn-down tyres. Nordstrom didn't - and still doesn't - sell tyres, and certainly did not sell any to this fellow (the confusion stemmed from the fact a tyre store used to exist in the same location). However, despite the fact these worn down tyres had absolutely nothing to do with them, this didn't stop Nordstrom from helping a brother out. The department store reportedly "gave this man some cash back for his old tyre" - probably amounting to a couple of hundred dollars. However, what the store lost in the short-term, it gained over the next 40+ years. Today, Nordstrom has over 300 stores spanning over 30 states. We think it was probably worth it. We hope this blog post has inspired you to start thinking about how your brand can let its customers know how important they are. To make your customer experience extra special, it’s worth writing down what makes your brand special/unique, and using this as part of your initiative. For example, if you’re an online florist, you could send complimentary flowers to your most loyal customers on Valentine’s Day. Free returns: this is something ASOS offer, and it goes a long way! Sending celebrity to birthday party: if you have the contacts, use them! Free coffee: This idea, recommended by Help Scout, is perfect for all you tea and coffee merchants out there! Do you have any of your own ideas to share? Tweet us @OmetriaData with your suggestions with the hashtag #treatyourcustomers and we’ll retweet our favourites.